THE CURIOUS CASE OF BENJAMIN BUTTON is an epic tale of one man’s life…a life lived backwards of sorts. Born in an old and withered body, but infant in size and in all other regards, Benjamin Button (Brad Pitt) begins his double journey of growing older mentally and emotionally, yet younger physically. His unique journey which begins in a convalescent home in Louisiana brings him across a myriad of characters who each have at least one important lesson to teach the young Benjamin. Among them, he meets the true love of his life, Daisy (Cate Blanchette). Though they are immediately separated by the most unique of all age differences, the two destined lovers criss-cross paths throughout their lives. Both Benjamin and Daisy are set on their own journeys which take them a part, around the globe, but time and time again, eventually back to each other. Matching David Fincher's fairy-tale like film is ALEXANDER DESPLAT's enchanting score. What works so well in many of the movies Desplat tends to write for (THE GIRL WITH THE PEARL EARRING, THE PAINTED VEIL) is his minimalist approach. Desplat is masterful at capturing the emotional essence of the film with minimal instrumentation. Although there was an 87 piece orchestra used for this film, it rarely sounds like it. 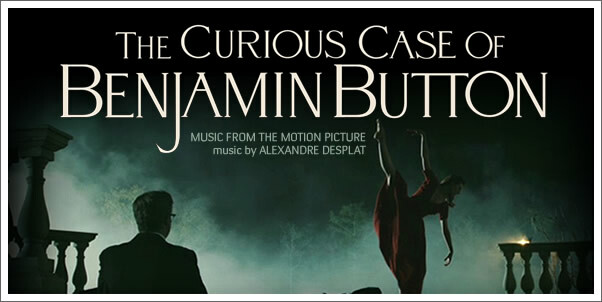 As his music did in the aforementioned films, only moreso, DESPLAT's score for THE CURIOUS CASE OF BENJAMIN BUTTON offers a magical element to the film. What Fincher accomplishes visually, Desplat does so through his music. They both create a world that is, at once, fanciful yet real. For his part, DESPLAT delivers a handful of well positioned themes, motifs and instrumentation that captures the essence of Benjamin, his circle of friends and family as well as it's locale. The end result is a melodic and introspective musical experience that has its own charm outside the context of the film.